Part 1: Witness History in the Making! is now being tested on Wikimedia Labs! The ASL Wikipedia Project on Wikimedia Labs is made possible by the generosity of the Wikimedia Foundation and Wikimedia Labs, which has provided our team the space on their server to further test and develop our SignWriting MediaWiki Plugin (SWMP). The SignWriting MediaWiki Plugin, developed by Steve Slevinski, makes it possible to write Wikipedia articles in American Sign Language in the SignWriting Script, directly on the web. We are so delighted to write encyclopedia articles in American Sign Language. Thank you, Wikimedia Foundation, for this historic opportunity! 1…a bilingual, educational, informational tool for Deaf students and ASL signers. The ASL Encyclopedia (printed books) and the ASL Wikipedia (online) will provide information about the world for Deaf and hearing people who use ASL as their daily, primary language. 2…a tool for teaching literacy in two languages: American Sign Language and English. The ASL articles in the online ASL Wikipedia, will be translations of the English articles in the online English Wikipedia, so bilingual learning is as easy as clicking on a tab in your web browser to read the same article in two different languages, ASL and English. 3…jobs for skilled ASL signers to write the articles in the ASL Wikipedia, and to also edit and provide technical support for others who post their own ASL articles online. Computers may have to be purchased for some ASL writers and editors, if they do not have their own up-to-date computer. Providing employment for the Deaf Community is an important element of this project. It will also provide work for skilled ASL interpreters and teachers. 4…projects for ASL classrooms, to translate English Wikipedia articles into written ASL and post the articles in the ASL Wikipedia…The project will provide special support for teachers. 5…groundbreaking software, “the SignWriting MediaWiki Plugin”, providing the online environment for ASL writers to compose their articles in SignWriting in ASL directly on the web. Thanks to software developer Steve Slevinski, we are already successfully posting ASL on a test Wikimedia server, but more development is necessary to complete the software, before it can be officially posted for the world to use. 6…ongoing technical support for writers, editors and software users. American Sign Language (ASL) is one of the most used sign languages in the world. Written ASL provides ASL signers with the opportunity to express themselves directly in their native language, to preserve the literature of their language and to provide information for those who do not know spoken languages. Wikipedias are growing encyclopedias on the web, written in many spoken languages. Before SignWriting, there was no way to write a Wikipedia in a sign language. SignWriting makes it possible to write encyclopedia articles in the facial expressions, movements and handshapes of sign languages. 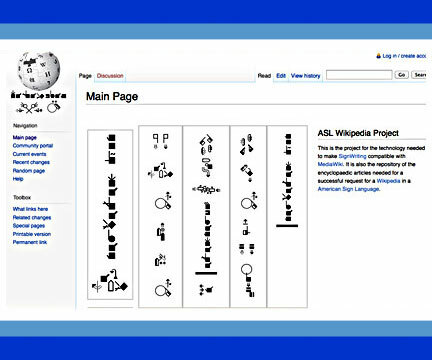 In 2007-2010, Wikipedia users requested a Wikipedia written in ASL using SignWriting. The SignWriting Encyclopedia Projects (SWEP) is sponsored by the US non-profit organization, the Center for Sutton Movement Writing, located in La Jolla, California, directed by Valerie Sutton, the inventor of SignWriting. The project sponsors Deaf authors and editors to write encyclopedia articles in ASL, which are written in SignWriting on a new web area called the SignWriting Wiki (signbank.org/wiki). The SignWriting Wiki site provides a testing area for our new software, the SignWriting MediaWiki Plugin. The ASL encyclopedia articles that are posted in the SignWriting Wiki will also be printed in books, donated to classrooms with Deaf students. The SignWriting Encyclopedia Projects (SWEP) began in May, 2010 and will be ongoing for at least a decade. It takes time to write an encyclopedia in any language! The project is historic for several reasons. Until SignWriting, it was assumed by most signers, that sign languages could not be written. Before now, sign languages were thought to be too visual to be written languages. With the first development of SignWriting in Denmark in 1974, small groups of signwriters started to experiment with writing their sign languages, and the groups grew in number from 1974 to the present, in over 40 countries. Sign languages are written languages for those individuals who write it daily, by hand or by computer. In 2010, books with over 500 pages are being published in SignWriting, including complete novels and portions of the Bible. As signers become adjusted to this new idea (that sign languages can be written), more people will turn to the encyclopedia articles on the web written in ASL, and slowly adjust to learning how to read their own language for the first time. SignWriting is quickly understood and read by skilled ASL signers. Writing encyclopedia articles in ASL takes more skill, however, and this is why the Center is raising funds for Deaf employment, to train editors and writers of the ASL Encyclopedia, to provide well-written articles. SignWriting symbols, invented by Valerie Sutton and tested for use by the Deaf Action Committee for SignWriting (DAC), are placed in a specific sequence, based on 7 symbol categories and 30 symbol groups. The International SignWriting Alphabet 2010 includes symbols needed to write over 40 sign languages. The ISWA 2010 can be analyzed by visiting the ISWA HTML Reference Guide 2010. Other sites that use the ISWA 2010 are ISWA Symbol Lessons, SignPuddle Online, and Sutton's SymbolBank. The primary purpose of the SignWriting Image Server is to display and edit SignWriting images fast with a simple installation. The secondary purpose is to document and demonstrate sign language as text. SWIS requires a web server with PHP and the GD graphics library. The vision of the SignWriting Image Server is to provide tools to view and edit Binary SignWriting. SWIS can and should be used to generate test data, verify image display, and model behavior for implementations with other programming languages on any platform. Binary SignWriting is a script encoding model for SignWriting. Users from over 40 countries access SignPuddle Online to write their dictionaries and documents in SignWriting. SignPuddle software is so easy and fun to use, and provides the tools to write and publish literature in the sign languages of the world. Information about the MediaWiki Extension. Any MediaWiki installation will be able to use this extension. The SignBank Wiki mentioned below is one example that uses the extension. This is a full installation of the SignWriting MediaWiki Plugin on our SignBank.org web site, providing an incubator or test area for trial postings of articles written in SignWriting in ASL. This can serve as a SignWriting Lab for programmers to test the software development.